Today I wanted to share a recipe with you that I made last week. I decided to try and make some Crockpot Turkey Sloppy Joe’s. I had been talking to a patient about recipes as she was getting ready to go out of town. She told me she was going to prepare some sloppy joe’s for her family and MAN did it get me craving some myself. I was not a huge sloppy joe fan when I was a kid, I mean I like them but they weren’t my favorite. I remember eating more than one serving but always topping it with cheese & mustard. I decided I wanted to try and make this Manwich classic my own and use my crockpot too! So I did some researching on different blogs both vegetarian & turkey sloppy joe’s, and after a bit of searching I decided to combine two recipes to make mine. SO….. I tossed everything in the crockpot & it looks good immediately, but then I thought hmmmm that looks a bit dry, so logically I added 28oz of water…. well instead of sloppy joe’s we got delicious turkey-lentil chili. We enjoyed this the first night with a side of GRILLED CHEESE!! yummm I haven’t had a grilled cheese in forever & the chili was a great comfort food addition to the meal. THEN I had it again for lunch on Saturday with the addition of some mozzarella cheese && for dinner on saturday… BUT for dinner I cooked up some whole wheat noodles, added some extra jalapeños & used the chili creation as the meat sauce it was WONDERFUL!!! Although I didn’t get my sloppy joe I was completely satisfied with this chili creation especially with the cold weather it was perfect to warm up with after a long day! I’d Love To Know ~~ Are you a sloppy joe fan? Have you ever had a meal with an identity crisis? I touched on this last week briefly & after writing about my funk here I decided that I needed to start making a change. I decided to set my alarm for a bit earlier and start hitting the gym before work. I usually spend Tuesday & Thursday mornings lounging at home leisurely getting ready, eating breakfast & watching GMA while reading some blogs before going to work at 10… I realized I have been wasting a LOT of time these days & could easily wake up a little bit earlier and HIT the gym BEFORE work. I used to workout in Ann Arbor at 6am with Devin & LOVED how I felt at 7am after a killer hour workout. I also loved knowing ALL DAY that I already worked out. Even though I was up earlier on these days, I always felt more energized and motivated throughout the day… SO why did I ever stop??? Thursday I got to the gym around 7:30, bound and determined to get an amazing workout in… I looked at the GPP workout for the day and decided I would do that but it would likely take me 30-40minutes to complete and I really wanted to do a solid hour workout. So I started on the squat rack & worked on my back squats. I took it really easy, started with some hip mobility (thats the tightest part of my squat and often limits my ability to perform a proper squat) with air squats & then slowly built up the weight. 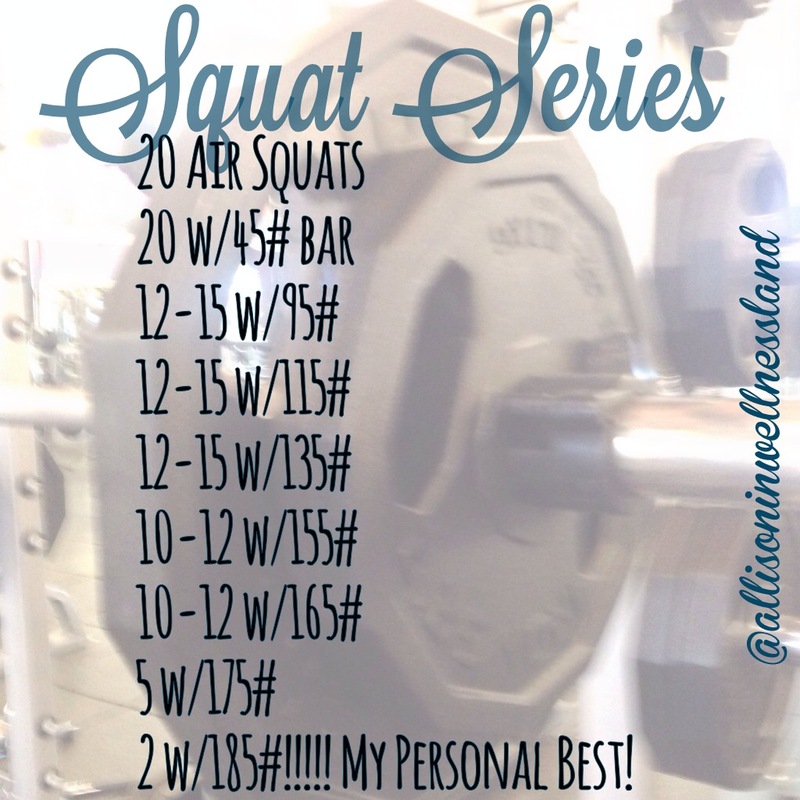 Squat Squat Squat!!! Personal Best after a proper warm up and slow-steady increased of weights. I got a solid 2 reps at the highest weight… I had difficulty/lost my balance coming up from the second butttt you can’t be afraid to fall when you are doing it to failure & correctly! 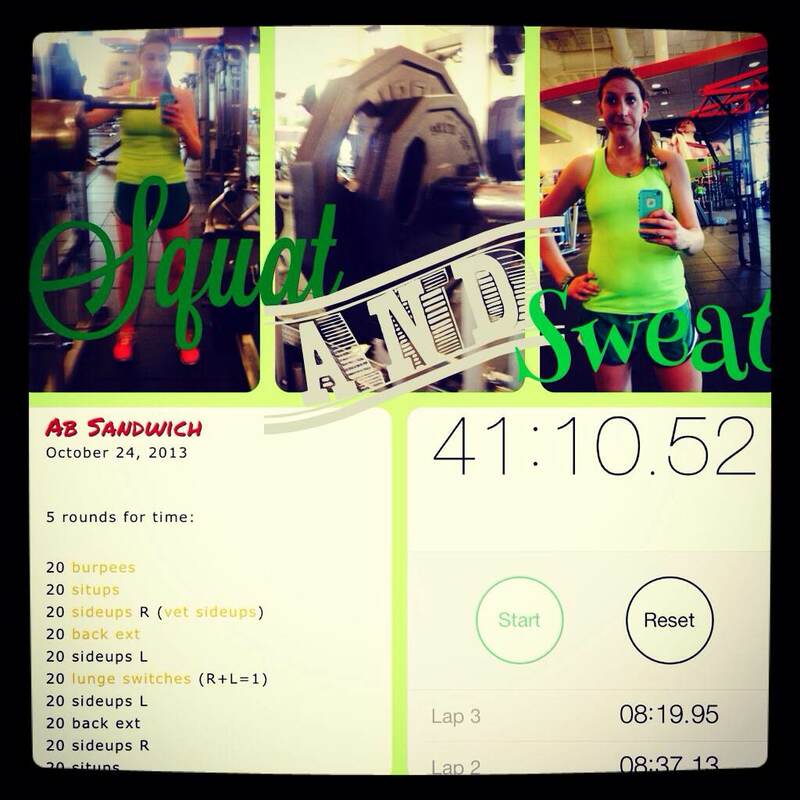 I then followed it up with GPP’s WOD which was Ab Sandwich & it did not fail in being a great workout! Since my legs were already at failure I modified this workout by doing half up-downs in place of the burpees (after the first round) and did alternating leg deep lunges instead of switch lunges. I hit the locker room to change and get ready for work PROUD of how I spent my morning & completely energized for the rest of the day. After work I went BACK to the gym and did an hour of yoga, MAN did I sweat on during that class, my muscles were still a bit fatigued from the morning but it felt great to know I had 2 workouts in one day and didn’t feel dead! Fresh & clean and ready to take on the day! I have decided to make a strong effort to hit the gym 3 mornings a week (tues, thurs & fri) & maybe work it up to going every morning. I also am going to continue sticking with the GPP workouts and yoga 2-3days/week since it seems to be working for me! I am really loving the energy from going earlier and am HOPING **fingers crossed** that it helps dig me out of this workout rut! Now I am off to hit the gym & get todays workout in! Have a happy & healthy Tuesday! I’d Love To Know ~~ Are you a morning workout-er? How do you stay motivated during a workout rut? I have to say I could use another day to this weekend! After a bunch of weekends filled with plans and travel it was really nice to have this weekend with nothing to do but relax and do whatever we wanted! Our weekend definitely took the “do what you want” route as we enjoyed the beautiful fall weather. Saturday we hit the “BEST APPLE ORCHARD AROUND” and were disappointed when the only apples they had to pick were Red & Green Delicious (not our favorites…) & it was FORTY dollars to go pick yourself… UMMM no thanks, I don’t need that many apples of a kind I am not extraordinarily fond of. 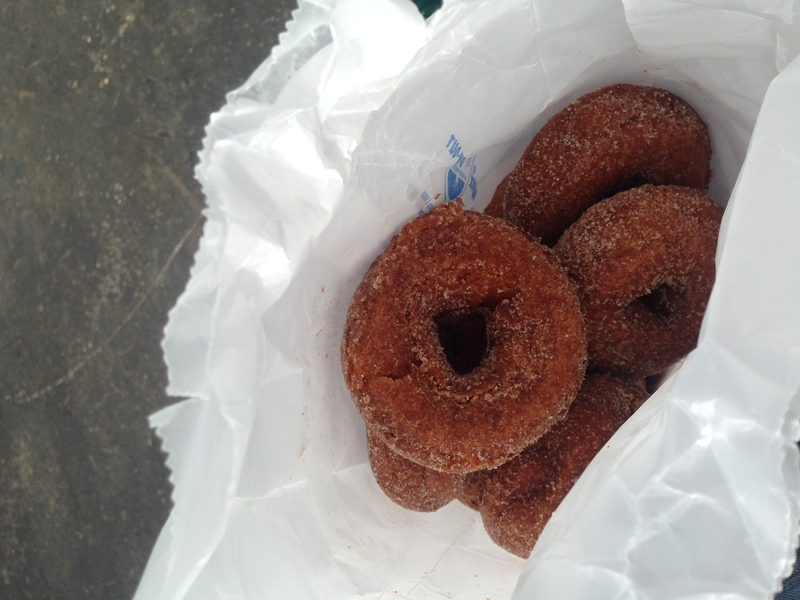 But the overall experience was fun, they had a lot of yummy samples and things to look at in the store & barn, PLUS some great apple cider donuts! 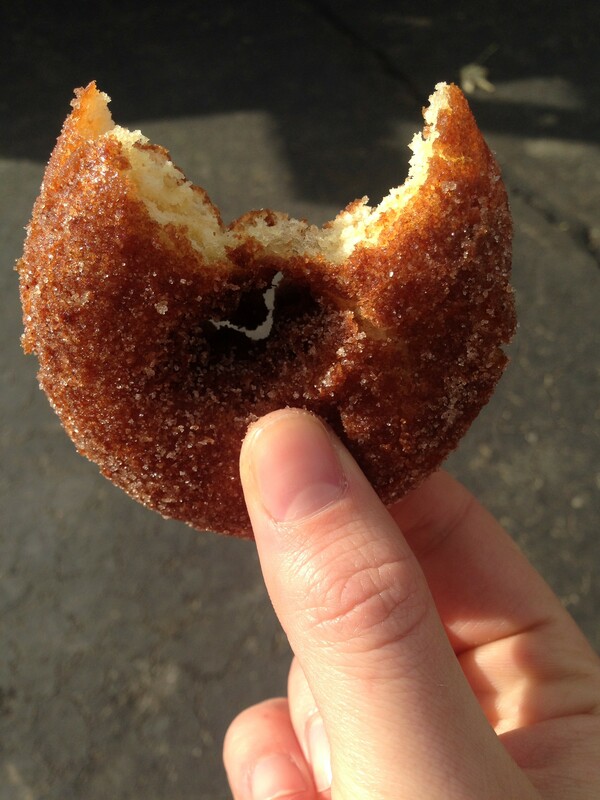 I am not usually a donut fan but these were too good not to love! After coming home from the Orchard we met up with some friends and their son for dinner at the local Japanese restaurant, where we proceeded to eat ALL THE FOOD… including sushi && habachi YUMM ((we did bring leftovers home though))… Followed by disney movie (food coma) night #2 of the weekend!!! AHH I love me some disney, I would definitely recommend both movies if you haven’t already seen them (The Crood’s & Epic)..
Sunday started off on a super good note! I went to the gym and my second yoga class, I followed the class with a quick power upper body lift session & then came home and dragged Brent out on a run with me…needless to say he ended up being the reason we finished the run on a good note… have I mentioned I HATE running.. I try to trick myself into thinking I can run but yeah its just a trick! 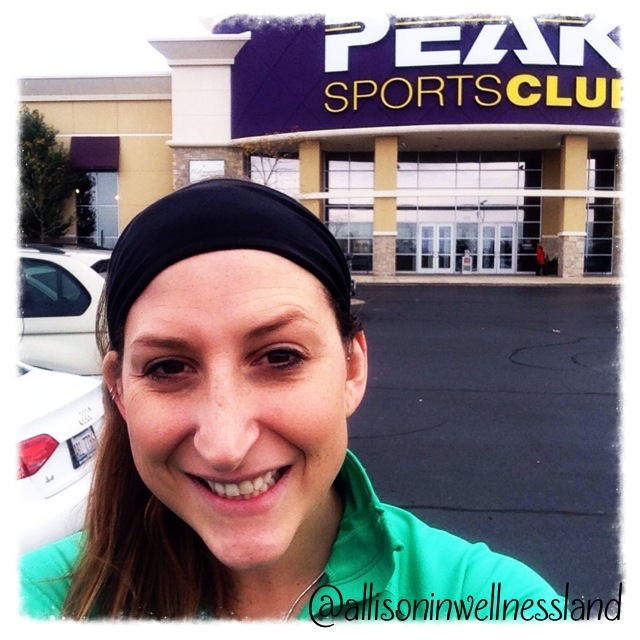 post yoga & lift.. pre-run… feeling great this fall day! We then continued our weekend of eating EVERYTHING we saw & ordered a pizza (something we rarely do). UGH eating everything in sight always seems like a good thing when you are in total fatkidmode but seriously it does major damage after the fact! I guess its really a good thing that today is Monday and I am not at home to eat everything! No need to dwell on the past, time to embrace the new and start each day with fresh eyes and a fresh look! This Monday I am in need of some NEW DAY motivation to be okay with my fat-kid weekend and MOVE ON! As much as I try not to over indulge (like this past weekend) when I do I try not to dwell on it, and rather embrace it and move on. Happy Monday, hope you all have a happy and healthy week! I’d Love To Know ~~ how do you overcome an indulgent weekend? Whats your favorite kind of apple? Good bye scale… week 2! Happy Thursday!!! This week seemed to be going really slow until today and now I cannot believe it’s already Thursday! I love that recently all my favorite blogs have been sharing some serious #realtalk about current challenges and triumphs. I love reading these posts because honestly I am going through a lot of the same things OR have experienced the same feelings at one point or another. Check out Jan , Amy && Katie who all have shared so many thoughts I’ve had this week! UGHHH I really don’t like that I did that to myself. Subconsciously making rules to make me feel better… OR worse.. About my body.. I would let the ## on the scale tell me if I was in “good shape” or “bad shape” which is NOT TRUE! I have learned a lot the past two weeks during my deliberate fast from the scale… I don’t need the scale to justify myself, I can look in the mirror and see my flaws & my strengths. I don’t need to have an “objective” number to tell me this! Also I am happier about myself. I know that sounds dumb also but seriously I have NO idea what my weight is at this moment and it doesn’t matter! I am sure I am +/- 5pounds of my typical weight (which I cannot seem to change for the life of me… Hence this scale siesta!) but I honestly feel good about myself and my body MOST days… There are always going to be days I don’t feel GREAT about my body but that’s life! I am excited to continue this challenge through October so I can continue to develop a healthier relationship with my body. I hope you have a healthy and happy Thursday while loving yourself and your body! I’d Love To Know~~ Have you ever set silly rules for yourself? What’s your relationship with your scale? I have a great recipe for you today! I really think I was having crockpot envy before buying mine the other week at Target. I have made something in it every week since buying it. & I cannot wait to make more things and experiment some more in it… I have my eye on some crockpot bread & oatmeal! The first week I made this Crockpot Quinoa Chili which was amazing! I cooked it a bit long SOO it was slightly over done but the flavor was great and definitely something I will made again. 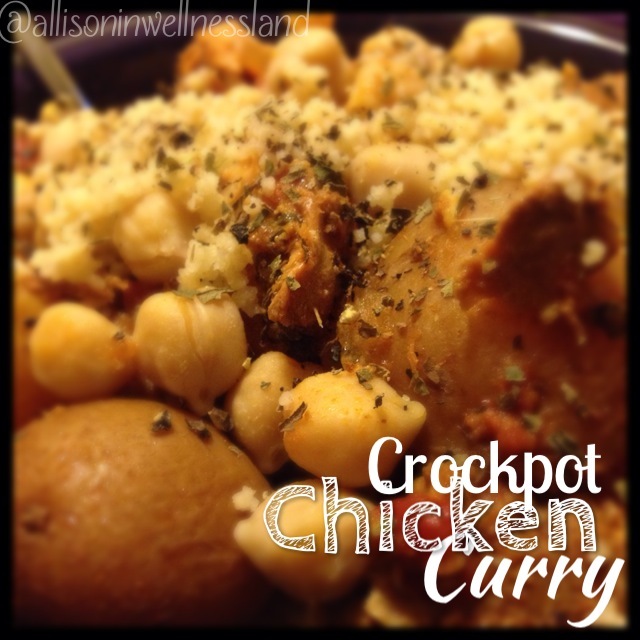 Last week I made Crapes of Wrath Curry Chicken in the crockpot & It was 100% amazing. Cooked perfectly and really very delicious. This week I made shredded kale pesto chicken in the crockpot… I made the chicken in the crockpot, shredded it and then added my already prepared kale pesto, let it sit over night and then plan to heat it up tonight and eat it on a sandwich thin! I love how green this chicken is! OK on to this weeks crockpot recipe… I love curry powder, and adding it into all different dishes, but I had never tried curry paste. HOLY level of flavor that you don’t normally get! first it gives the dish a really pretty color (that typical curry color) and second it really takes the flavor to another level! I am excited to try more recipes with this stuff! I cooked up some whole wheat couscous to soak up some of the flavor & juices from the chicken! It was PERFECT! Seriously it was super easy & really tasty. I always prep my crockpot meals the night before & throw the pot in the fridge until the next morning. Then it is really easy and convenient to put it in the crockpot and turning it on before heading out the door. Happy Wednesday y’all! Hope you have a wonderful day and try some new foods! I’d Love To Know ~~ Are you a curry fan? How do you like to prepare it? 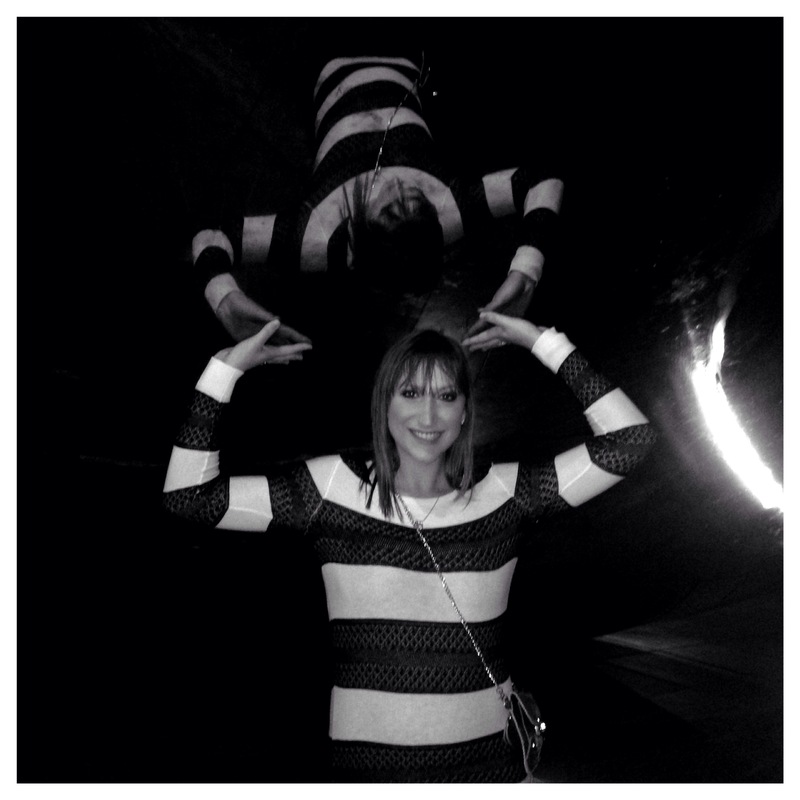 I hope you all had a wonderful weekend! Mine was absolutely wonderful & relaxing, however was yet another whirlwind of a weekend… I love that these past few weeks have had something exciting to look forward to on the weekend but I am even more excited that this weekend I have NOTHING on the schedule!! First was anyone else completely exhausted this past week?? I had a crazy busy week at work and when I would get home from the gym I often found myself falling asleep on the couch & then crawling in bed… at 9:30… and passing out… UGH! 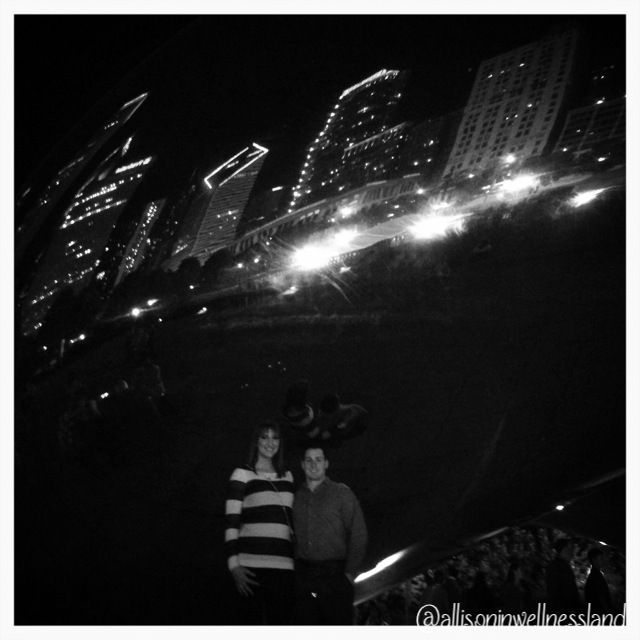 Last week Brent was in Chicago for a course and I took the train to meet him Friday night and spend the weekend together in the City! I was really excited because SUNDAY was the Chicago Marathon… Now I am NOOO runner, actually I really dislike running and regularly wish I enjoyed it, but I was really excited to be in the city and a spectator at this great event! If you WANT something, you’ve never HAD, then you’ve got to DO something you’ve never DONE! 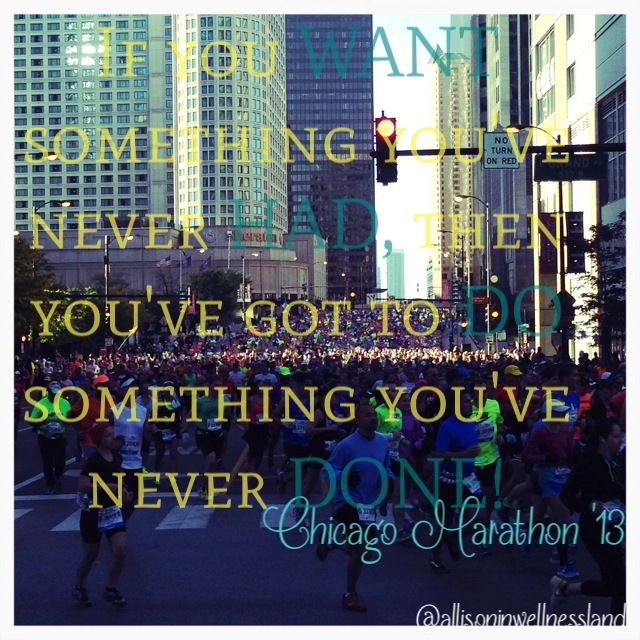 Not one of those marathoners decided one day, lets just run a marathon, without training or practice, lets just go…. NOPE they all decided they WANTED something so they started the journey to GET IT… You can never accomplish something without trying, sorry a marathon wont just happen upon you, you’ve got to get after it. So lets start our week on this motivational note & get after our week making it great! I’d Love To Know ~~ Have you ever run a marathon? Were you completely exhausted last week?? Please say it wasn’t just me!